If there's one appetizer that best captures the balance of sweet, salty, crispy, creamy, fruity and meaty, it's Bacon Wrapped Dates. I was surprised to find out that my brother and his friends had never tried this amazing concoction. Once that was out, these found their way into our Superbowl menu. It worked out perfectly because I scored a deal at the grocery store where I picked up 2 pounds of dates for $.98. Yes... less than a dollar for these babies! Putting these appetizers together couldn't have been any easier either. It's just 2 ingredients - dates and bacon! Now if you wanted to jazz this appetizer even further, you could even stuff the dates with cheese such as parmesan, asiago, blue cheese or even feta.... now that's decadent! Preheat the oven to 375. Prepare your baking sheet by lining it with foil, set aside. Cut your package of bacon in half down the middle so you have twice as many slices that are shorter. Remove the pits from the dates with a small paring knife and discard the pits. Take one short slice of bacon and wrap around the pitted date. Place the wrapped date on the foil lined baking sheet. 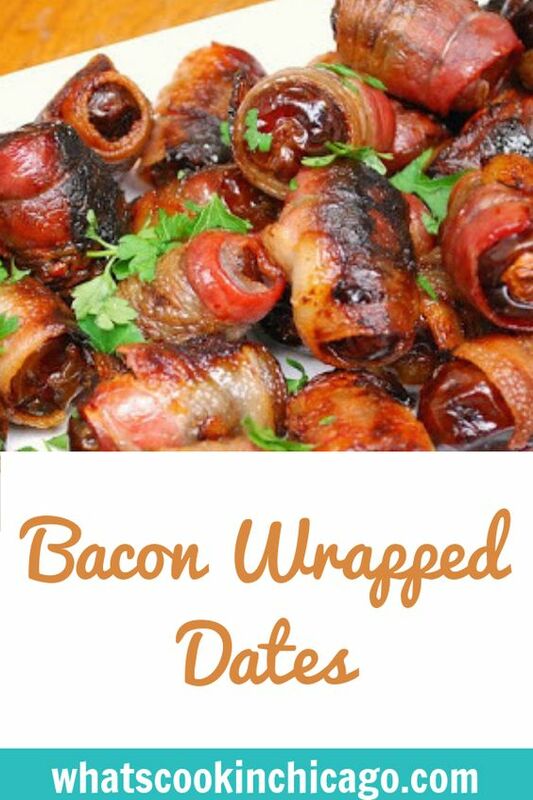 Continue to wrap all the dates with bacon until all bacon is used up and place on the baking sheet. Bake the dates in the preheated oven for 20-25 minutes until the bacon becomes crispy. Remove from the baking sheet and place on serving platter. Allow to cook 10-15 minutes before serving. Try it stuffed with Spanish chorizo ala Blackbird - it's fabulous! And so easy! I have not had these either - and I don't know why!! They look delicious - and easy! I love these things...so good. I usually stuff mine with an almond- YUM! I've also tried them stuffed with banana which is really tasty, too. A friend of mine puts the date inside a jalapeno pepper and wraps that in bacon. OMG, so good! How did you get medjools for a dollar???? Sheilah, I often shop at ethnic markets where prices are much cheaper. For these dates, I shopped at a Mediterranean market.